Rob Costelloe is an intriguing author, he has a penchant for love stories, yet they are not love stories in the traditional sense of the word, they are more stories that explore the complex concepts of love and loss. When you mention books and love stories in the same sentence most people will have automatic reflex thoughts ofÂ ‘Harlequin’ and tawdry, ill written tales of lusty debauchery, set against a backdrop of 18th century manor houses and fields of golden crops. Forget it! Rob Costelloe does not write that kind of book. This author weaves intricate plot lines aroundÂ the lofty goal of a higher love. Pocket Piece Cameo is a very well crafted work, and follows the travails of two high school sweethearts, Blake is the rough and tough football player, who has a much softer side to him than is seen on the field. Blake has two obsessions in his young life, football and love. He is not in love with love, he just wants to understand it. In his eyes too many couples allow this precious commodity to run through their hands like grains of sand.Â Jill is a tomboyish and impish young lady with a penchant for playing on the wild side. These seemingly disparate characters find a common bond, but, alas, as life has a way of doing, this idyllic relationship must end. Jill is forced to relocate to the West Coast when her parents hardware business fails, and they decide to try to restart their lives in Seattle. The young lovers vow to remain true to each other, and an antique cameo broach becomes the one tangible object affirming their life long commitment. Not everyone is happy with the young lovers, and a meddlesome hand works its evil on the young couple. Distraught and confused, these now separated young people are forced to seek solace where they may find it. For Blake it is the football field, though his quest for finding that higher love still lingers in his heart, and a chance encounter with a college reporter rekindles many of his emotions. For Jill it is a different road, one that involves casual relationships, and drugs, as she slips quietly into the abyss of self destruction. I will not divulge more of the plot, but I will say this, Pocket Piece Cameo is a very fine read. Rob Costelloe writes in a style like no other author I can think of. His first book Coinage Of Commitment tugged at my heartstrings, and Pocket Piece Cameo had the same effect. There are no steamy love scenes, but there are some very raw emotions that Rob Costelloe does a remarkable job of capturing as a word picture. I have to admit that while reading the first part of the book, my mind drifted back to my teenage years (40 years ago!) and I reflected back on my first faltering footsteps in search of true love.Â In fact the book made me reflect on my entire life, why did my first marriage fail? After almost 20 years, you would think a relationship would be cast in stone. What went wrong? The flame went out, the illusive flame that is powered by love. Love, as Rob Costelloe explains is an emotion that requires constant attention. I have learned my lesson, I work hard on the love aspect with my second wife Jan.
Pocket Piece Cameo likely would not be a prime pick for the male reader, which is a shame, because hidden in the story itself are some very fine ideals for living. I enjoyed this book a great deal. So here is my recommendation, there is still time to get this book before Christmas, buy it for your wife or girlfriend, and when she isn’t looking, sneak a peek! 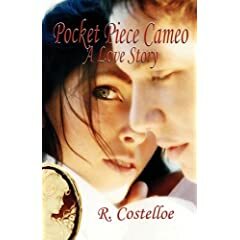 4 users commented in " Book review: Pocket Piece Cameo â€“ A Love Story by Rob Costelloe "
Very good review, made note to myself to buy it. My husband won’t read it, but he will allow me to read pieces to him. He’s no reader, but a person who listens to booktapes as he walks. Everyone likes to think of their first love and usually life does interfer with that love because: 1) you are most likely a teen-ager(like the story) 2. you are too immature to handle the love 3. you outgrow each other My husband had been married and divorced before we met, and I always wished I had been his first love, even though he wasn’t my first love either. In fact, seems to me that I fell in and out of love every week when I was a teen-ager. So happy I ended up with the love of my life. Love seems so hit and miss sometimes. This book sounds like a good read, not too syrupy sweet, and shows what happens as we break up and move on. After reading this author’s first work, I knew I had to have this one in my collection. Pocket Piece Cameo wraps you up in the story while at the same time evoking memories of your own past. It is effortless to identify with the characters and their growth. My Rx: this book is a must have with a cup of hot cocoa on an overcast day! It’s been a love story that has survived the ravages of time. It all began 13 years ago when Punam Prasad and Prasad were studying management. It was just meant to be, love at first sight, an informal introduction and the two were bound for life. Recounts Prasad, Co-Founder of Logivserve (www.logicserve.com) , a Search Engine Marketing company.